Amidst all the chaos and hearsay, the ICC Cricket World Cup 2019 will commence on the 30th May at The Kia Oval, Kennington, London. England and Wales will host the tournament that will last till 14th July 2019. The format of the championship will be simple round-robin where 10 teams will participate, with each team taking on the other 9 teams and the top 4 teams qualifying for the knockouts. The exhilaration for the tournament is spreading like wildfire among the cricket fans as the World Cup is the most prestigious tournament in the history of world cricket. The teams have been preparing hard for the tournament as each of them wants to achieve the honorable feat of being the World Champions. The Indian team is considered to be one of the hot favorites of the upcoming World Cup. Barring the middle order woes, the team looks quite strong in almost every other department. And as the World Cup is around the corner, here are the three probable players who might do well in their respective departments during the World Cup. Virat Kohli is arguably the fittest cricketer going around in the cricketing world at the moment. The prolific batsman does not only score a lot of runs with the bat but also saves quite a lot of runs for his side with his athletic fielding. The Delhi-lad's fitness provides him the capability of pulling off some blinders whilst fielding. 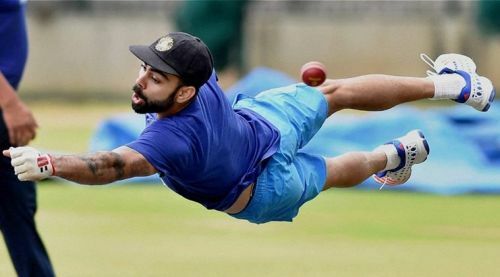 Whilst, on one hand, the Indian fans and management will definitely want Virat Kohli to perform well as a Batsman and the captain during the 2019 World Cup, on the other hand, it would be the fielding skills of the Indian skipper that might make a lot of difference during the all important tournament.